metR packages several functions and utilities that make R better for handling meteorological data in the tidy data paradigm. It started mostly sa a packaging of assorted wrapers and tricks that I wrote for my day to day work as a researcher in atmospheric sciences. Since then, it has grown organically and for my own needs and feedback from users. Conceptually it's divided into visualization tools and data tools. The former are geoms, stats and scales that help with plotting using ggplot2, such as stat_contour_fill() or scale_y_level(), while the later are functions for common data processing tools in the atmospheric sciences, such as Derivate() or EOF(); these are implemented to work in the data.table paradigm, but also work with regular data frames. Currently metR is in developement but maturing. Most functions check arguments and there are some tests. However, some functions might change it's interface, and functionality can be moved to other packages, so please bear that in mind. 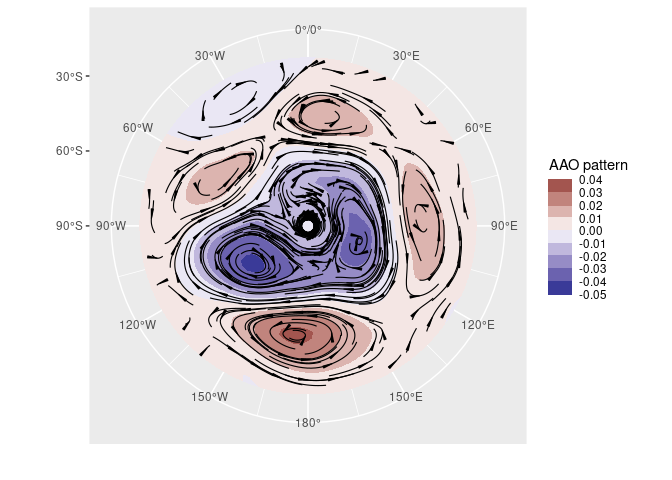 In this example we easily perform Principal Components Decomposition (EOF) on monthly geopotential height, then compute the geostrophic wind associated with this field and plot the field with filled contours and the wind with streamlines. geom_contour_fill(binwidth = binwidth, xwrap = c(0, 360)) +    # filled contours! #> deprecated. Use ggperiodic::periodic insead. You can read more in the vignettes: Visualization tools and Working with data. Anomaly() has a new baseline argument. New function Trajectory() that computes trajectories in time-varying velocity fields. ReadNetCDF() now accepts dates as elements for subset. ReadNetCDF() will read all dates correctly (#91; thanks to @m-saenger). There has been some changes in the interface of some functions for the sake of consistency. In Derivate() (and it's derivated functions --see what I did there? ), the data argument has been moved back. This is because this function is intended to be called inside a data.table of mutate() call, where you don't need to explicitly specify the data. In EOF() the dcast-style formula interface has been removed. The data argument was also moved back so you can use the n argument more easily without naming it. ImputeEOF() follows the same conventions. The dcast-style interface has been removed and the data argument has been moved after the max.eof argument. BuildQsWave() and FitQsWave() have been removed and should had never even existed. The default skip argument for geom_text_contour() is now 0. Removed hemisphere argument from season() since the function returns the trimester so it made no sense. Contour functions now compute breaks globaly (using all the data) instead of per panel. This means default intercomparabilty between facetwed plots but also a considerable deviation from ggplot2::geom_contour(). The Between operators are removed since they were already implemented in data.table. Arrows in geom_arrow() and geom_vector() scale with vector magnitude. New geom geom_streamline() for visualizing vector fields. Utilities dlon(), dlat(), dx(), dy() for converting physical units into spherical units. New geom geom_contour_tanaka() that plots illuminated contours. New function Interpolate() for bilinear interpolation. Fixed bug in FitWave() with wavenumber 0. Now it rerturns the mean. FitWave() runs slightly faster and BuildWave() runs much faster. Removed GeomContourFill object since it was just a polygon. New scale scale_mag() and guide guide_vector() for controlling and communicating the scale of vectors. These are highly experimental and will change in the future, but provide some very needed functionality so I decided to export them as they are. geom_arrow() gains new pivot agument to control point of rotation and preserve.dir to tell if angle should be preserved. stat_contour_fill() and stat_contour2() print a warning when no contours can be made. EOF() now supports estimation of confidence intervals via bootstrap. EOF() supports varimax rotation. Rotated components are labeled accordingly. geom_relief() is much faster now (but see package rayshader). New geom_shadow() for casting shadows in topographic maps. Contour calculations in StatContour2 are memoised so they are only computed once even adding several layers with the same contours (geom_contour() + geom_text_contour()) or running the same plot while tweaking it's appearance. New FitLm() for getting fast estimates of linear fits. New FilterWave() for filtering waves. Circular dimensions had quite a ride during this developement process. RepeatCircular() was deprecated in favour of WrapCircular() which is more robust, and then WrapCircular() was deprecated in favour of the ggperiodic package. The way that stat_contour2(), stat_contour_fill() and geom_streamlines() handle circular dimensions has changed. Now you need to use xwrap/ywrap to explicitly set the domain. This makes the implementation more robust and also allow to easily wrap to an arbitrary domain. After that change, the wrapping functionallity has moved to ggperiodic, which can handle this stuff better. The above mentioned arguments still work but are not documented and will be deprecated. EOF() gains a fill argument for sparse-ish data. geom_text_contour() now has the ability to draw a stroke around text. geom_contour_fill() now can impute missing values with bivariate interpolation. BuildField() actually renamed BuildWave() (which should've happen in the previous release acording to this News). New function as.path() and added functionality to Interpolate() that allows to interpolate values along a path of locations. New function Impute2D() which is an exported version of the method used by geom_contour_fill() to (soft) impute missing values. subset argument in ReadNetCDF() now accepts character vectors for time components. ReadNetCDF() now can output arrays and vectors. New website (https://eliocamp.github.io/metR/) with documentation. Thanks to pkgdown. New functions: coriolis() and coriolis.dy(). Faster Anomaly() (can't believe I did that). For consistency with stat_contour() created geom_contour_fill() which works just like stat_contour_fill(). Added stat_na() for easy masking of NA values. geom_arrow() now is geom_vector() with better documentation and more parameters and geom_arrow() is a new geom for arrows that preserve direction. ReadNetCDF() now handles more date formats. New functions related to several physical processes (see ?physics). New geom_text_contour() and geom_label_contour() for labeling contours. Fixed? werid bug with ReadNetCDF() and as.POSIXct. ReadNetCDF() now supports timezones via de udunits2 package. Fixed bad polygon ordering and extra polygon in stat_contour_fill(). New functions MakeBreaks() and AnchorBreaks(). New guide. guide_colorstrip() displays discretized values of a continuous color or fill scale. New geom_relief() for generating relief shading. ReadNetCDF() gains a subset argument for subseting data. AnchorBreaks() is a new way of generating breaks. New geom_contour2() that takes a function as argument in breaks and geom_contour_fill() also does the same. 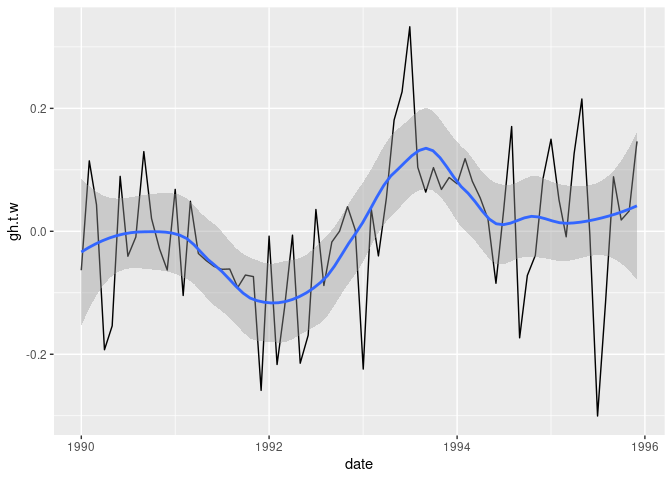 New stat_subset() that makes subsetting data on the fly easier. ReadNetCDF() can return a keyed data.table. FitQsWave() and BuildQsWave() renamed to FitWave() and BuildWave(), respectively. GetSMNData() is updated to include the new SMN website and data types. geom_contour2() and geom_contour_fill() gain a circular argument to specify a circular dimension. LonLabel() and LatLabel() aid labeling latitude and longitude. Changed interface of EOF() and ImputeEOF().